With finals week finally ending, I am feeling ready to get started on the holiday gift shopping frenzy. For all my fellow females out there -- Is it just me, or is it close to impossible to shop for guys? Whether it be a dad, friend, or significant other, the male species just has a way of making gift-giving extra difficult. I've already given my boyfriend Victor shoes twice during our relationship, and this year might have to be lucky number three with Skechers' Mark Nason line. We loved the Harrow boots because they combine function and quality with a refined look. For those of you who also experience unpredictable winter weather, these are the perfect accessories for the guy in your life. To make your holiday shopping easier, why not pick up a pair of shoes for your best girl friend as well (or yourself)? I chose to go with the edgier Big Bolt boots to challenge myself in terms of style. 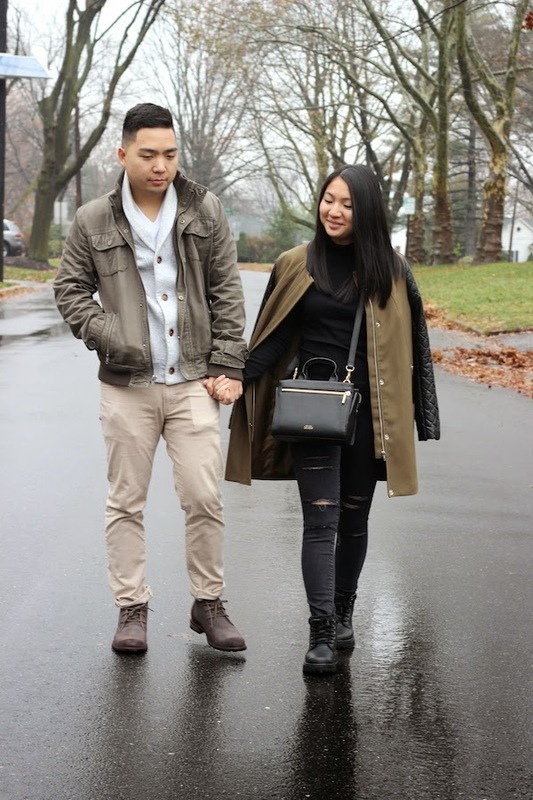 Both Victor and I opted to stick with a color palette of neutrals and olive green to complement the shoes. The quilted leather accents and distressed details of my outfit add more interesting details to the darker look and speak to my personal style. I'm also debuting my Cyber Weekend purchase from Kate Spade Saturday that I can't get enough of -- Seriously guys, check them out. I hope you enjoy these periodic couple posts! Victor and I love creating these (although he may not always show it), and we would be happy to come up with more looks. Men's fashion is important too! Disclaimer: This post was written in collaboration with Skechers. All opinions are my own. You look amazing, I love your jeans and whilst Victor looks a little like he doesn't want to be modelling, at least he's well styled too! Both of you look so amazing and stylish. Have a nice weekend. Thank you Sophia! Hope you had a great weekend! Love both your outfits! The boots look good on you Christina, you rock them! Victors boots are nice as well, great choice! Thanks so much, Tania!! I'm sure he loves the watches haha I've been looking at some for Victor as well! Both of you look so amazing and stylish.